Converting your Perodua Myvi to a turbo? Home » Cars » Malaysian Makes » Perodua » Converting your Perodua Myvi to a turbo? The premium model Perodua Myvi comes with a 1.3 DVVT DOHC engine designated the K3-VE. This same engine is used in most 1.3 Daihatsus like the Daihatsu YRV, and of course the Toyota Avanza and the Perodua Kembara DVVT. 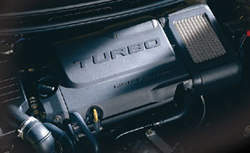 To make the Daihatsu YRV go even faster, Daihatsu added a turbocharger with an intercooler to it’s already powerful K3-VE engine. This makes the engine have one of the highest output and torque for an engine of it’s class. The turbocharger kicks in from low-boost RPMs to provide excellent driveability. The DVVT mechanism continuously adjusts the valve timing according to engine speed. This makes the K3-VET a formidable performance engine. You can enjoy thrilling power at high-end RPMs and hard weight-pulling torque at low RPM. A K3-VET in a Perodua Myvi will be FAST! The Myvi is only 953kg, and the K3-VET puts out 140ps. That’s some crazy power-to-weight ratio. The downside is YRV half-cuts only come in 4-speed automatic. Manual fanboys will have to find some other alternative.